I know it isn't birth story day but I received this story yesterday and just couldn't wait to share it. It is about a mom who planned a VBAC, then was talked out of it, but ended up with one in the end- on the day of her scheduled repeat. This is such a beautiful story about faith and fate and what women are capable of. Enjoy and share! My son wiggled anxiously as we stood at line at Wal-Mart. "I wann dis!" he exclaimed, holding up a Golden Book with a dump truck on the front some patron must have left before us. "No, baby," I said, "Put it back." He put it back and frowned. The man in front us picked it up and put it his cart. My big pregnant belly made my back hurt. "Tomorrow, this child is coming!" I thought with a mix of dread as well as anticipation. All my hopes of a vaginal birth were slowly disappearing. The repeat c-section was scheduled for tomorrow. "But I suppose God's in control," I reminded myself. With that thought still in my head, I noticed the man in front of us had finished checking out. He turned to my son and handed him back the book I'd refused him. "A gift from me," he said and gave me a smile, "Be good for your Mama!" I smiled back graciously and waited for my groceries to scan. I tried to hide the tears that came unbidden to my eyes. Perhaps God still knew where I was after all! I was discouraged. I had done everything I knew to start labor on my own, but nothing worked. I walked, I climbed stairs, I prayed furiously, but other than a few contractions, it seemed to do little good. When I got home, I got a call from the hospital confirming our appointment. "7:00 am check-in. Surgery around 9:00 am. We'll have you in your room by noon!" It felt surreal. I ate dinner and had a snack before bed. No more food till after surgery, I'd been told. Surgery! I'd finally consented. I had been so confident in my ability to VBAC. I had gone with the same doctor who had done my first c-section. He'd promised me after my surgery that the low transverse scar was good for laboring and that if I wanted to do a VBAC, I had the option. When I came back to him, pregnant and seeking the VBAC, he told me he'd "just delivered a VBAC last week" and that "we can do that." He also told me that since my c-section had been for "fetal distress" I had a better chance statistically of delivering this next one vaginally. This was before he changed his tune. It was about a month from my due date when he approached me with the idea of scheduling a repeat cesarean. I was aghast! I'd already signed the VBAC consent form, but now I was hearing about how the VBAC was "better for me" but surgery was "better for the baby." He told me that if, by some chance, my uterus ruptured, he couldn't save me. "We used to promise women we could, but then we discovered we couldn't." I bit my lip and tried to hold in my emotion. I said nothing, but agreed to take the form home with me. I wouldn't make any decisions there. He mentioned it the next appointment. "We could have it as a back-up plan," he told me, "it can be hard to schedule, so this way it's on the books." It made sense to me. I asked when he was thinking. He told me the day before my due date. I told him, "no." 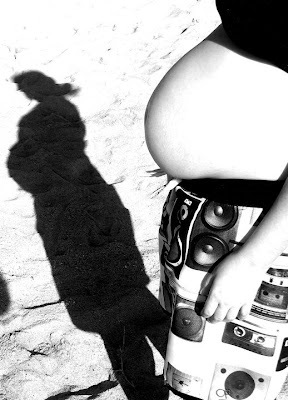 A baby's due date could be off by two weeks on either side. The next week I just didn't go. Doubts began to nibble into my confidence. My last baby had been 8lbs 13oz and I hadn't been able to deliver him vaginally. My mom's second child had been 10lbs 13oz (she'd been glad to deliver him surgically). Perhaps I just wasn't meant to give birth the way everyone else did. When the doctor mentioned that I could wait, but that "babies only get bigger," I broke. Perhaps I could scheduled it for a weekend so my husband wouldn't have to miss work. "We don't do Saturday, but end of the week would work great!" my doctor had said, cheerfully, "I'll have my secretary give you a call." She called to tell me my date was Thursday, the day after my due date. I did something that didn't come naturally, I argued. "Do you have something for next week?" I asked. I could almost hear her frown, "Well, doctor's out of town Monday. Tuesday is open." I told her I wanted it. "I'll talk with your doctor and see if that's okay." It was. And now it was Monday night. I tried to sleep, but it came little and fitfully. I finally got up to void my bladder. Something was different, though. I had very little control over it. I went back to sleep, but woke again. This time there was no mistake. My water had broken. Hope surged through me! I felt a contraction and the thought came, "I'm in labor!" I woke my husband and told him. The contractions seemed to be coming pretty consistently. Sure enough, they were coming every five minutes, on the dot. It was slightly uncanny as my husband would call out, "You should be feeling one...right...about...NOW!" We spent an hour counting contractions and waiting for morning. Finally, we grabbed our son to drop him off at my mom's and headed for the hospital. I had to shake my head with irony as I doubled over in contraction signing in for our c-section. My husband handed her over the insurance card and casually said, "But she's in labor." "Oh!" the woman said, "Will they let you labor?" "I sure hope so!" I said. The nurses were wondering the same thing as we arrived. I dressed and went to sit, but was told "not to get too comfortable, because we might be moving rooms." To move to the labor floor instead of the surgery floor would be wonderful! I tried not to get too comfortable. As the nurse went out to get my chart she found my doctor outside. She brought him in. "I hear your water broke..." his face changed as a contraction hit me, "and it looks like you're in labor. What do you want to do?" I was told I'd have to resign the consent form. I would, indeed, be changing rooms. But he was agreeable. Is it possible to be giddy in labor? Labor was going really well. I watched the monitors as each contraction hit. Baby was doing just fine. The nurses put in guesses as to girl or boy. One thought boy on an old wives tale concerning low heartrates. The contractions were stronger, harder, I could feel it as well as see it. I breathed and moaned through each one. I was so thankful to be in labor, I didn't mind. But they were starting to hurt and those in the room could see it. "Honey, there's no shame in pain meds. Can I get you something?" "Well the epidural guy's downstairs if you end up needing it." I was breathing too nosily to answer so my husband answered for me, "She's afraid it will slow down labor." And I was. And I knew Pitocin was not an option. Besides, I'd had Pitocin and an epidural with my last and hadn't managed to get past 8 cm, how much slower with an epidural and NO inducing? I was sticking it out. I labored all morning and into the afternoon. At three, I had a nurse change. I was vocalizing pretty strongly by now. "She sounds like she's ready to bear down," the new nurse said. "Nope, she's only an 8. She's still got a few hours to go." My current nurses prediction scared me. A few more HOURS? I began to hurt all over, losing my nerve. An 8. I had never got past 8 cm, but I couldn't do this for that much longer. An epidural was giving up. I'd still end up in surgery. But I didn't care. I consented for the epidural and waited in agony until the man with the drugs came. Everything was whirl of pain and waiting. I didn't even sign the consent for the pain meds until after he'd already administered them. Finally, I was resting comfortably and watching contractions that I no longer felt print out on the piece of paper coming out of the monitor. I sighed. My husband leaned in close. "You're a nine," he said. I looked at him blankly, "What? When?" "The nurse checked you right before you got the epidural and said you were 9 cm." He grinned. I was dumbfounded. 9 cm! Just a little bit further to go! I began to gather some more confidence. The nurse cheered me on. "Not too long and we'll be having this baby!" she said. The next three hours were LONG! I was just about dilated, but there was a nub in the way. We waited for the nub to disappear in order to begin pushing. Then it happened! I began pushing at 6:00 pm. The nurse coached me through it. "Push into your tailbone!" she directed, "That's good!" Over and over. She could see the head. Oh there's hair! Beautiful! She told me to stop and called the doctor. I wished for a mirror! I couldn't feel a thing as my girl came into the world, but I heard her cry! The nurse put her immediately on my tummy and tears of joy came to my eyes. "What's her name?" the nurse asked. I was cleaned up. The grandparents let in. I gloried in my little one! She nursed like a champion and I got dinner, too. We slept later, our little family, all the while thanking God for my beautiful little one. Six weeks later I walked into my doctor's office, baby in hand. We went through the normal preliminary questions. "How's the bleeding?" "How's nursing?" Then we got to one she didn't like the answer to. "What are you guys using for birth control?" I could tell she was unhappy. She shifted to one side and gazed at the doctor with a "knowing" look. I waited. But the lecture didn't come. When the doctor finally caught that his response was required, he just smiled. "This woman just had a 9lb 13oz VBAC that I told her she wouldn't be able to have. She can do whatever she wants with her body. I'm okay with it!" With that, he moved over and shook my hand. "I just wanted to say, 'Congrats!'" he told me, "You fought me at every turn, but you knew what you needed and you did it. Enjoy your baby!" I had an unexpected hospital vbac also! 36 hours before my scheduled c-section. What an awesome feeling! And I know exactly what she meant about being giddy during labor, because I WAS TOO!! Congrats on your vbac, Mama! What a lovely story. I think it was just what I needed today. After two months I just heard back from a midwife (who had been out of the state on business) and wanted to know if I still wanted to meet. I may get my VBAC after all. I've been a bit wishy washy but all I can think is perhaps this was fate. That is so awesome! I'm surprised that noone thought to mention that you'd progressed to 9 cm before you got the epidural. I know where you were mentally, I was stuck at 7 for several hours at each of my births and it was I was SO happy and encouraged when I finally progressed past that. Anyways, wonderful birth story and good for you for standing up for what you wanted! Praise God!!! Welcome to the world little Abigail and congrats to the family! So wonderful! Congratulations to this momma! Oh, I'm all teary eyed now. What a wonderful birth story! This is an amazing story! Great job! I'm proud of you and overjoyed for your experience. I know a woman who is at the end of her 2nd pregnancy and she's already effaced and dilating but she's still going to have another cesarean. It does make me a little sad but at the same time, we each get to take our own journey's and what's best for me might not be best for her. Love it! I had two vaginal births, but ended up having a c-section with my twins. I would love to have a VBAC, I worry about the risks and hate it when people tell you horror stories about someone they once heard of. This story gave me courage and confidence to try a VBAC! Thank You! !